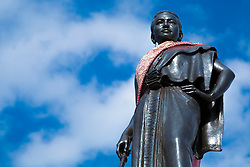 Thao Suranari is the royally bestowed title of Lady Mo, (1771–1852), who was the wife of the deputy governor of Nakhon Ratchasima (Korat), the stronghold of Siamese control over its Laotian vassals.%0A%0AIn 1826 Vientiane King Anouvong invaded Siam seeking complete independence. 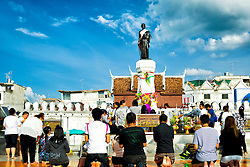 Anuvong's forces seized the city of Nakhon Ratchasima by a ruse when the governor was away.%0A%0AThe invaders evacuated the inhabitants, intending to resettle them in Laos. Lady Mo is credited with saving her people by harassing the enemy.%0A%0AVarying stories describe her either getting the invading soldiers drunk, or leading a rebellion of the prisoners on the way back to Vientiane. The generally accepted version is that, when the Lao invaders ordered the women to cook for them, Lady Mo requested knives so that food might be prepared. That night, when the invaders were asleep, she gave the knives to the imprisoned men. They surprised the Lao troops, who fled, and the prisoners escaped.%0A%0AThai King Rama III soon sent an army in pursuit, led by General Sing Singhaseni. 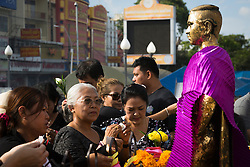 He defeated Anuvoung's forces in 3 days of fighting and completely destroyed Anuvoung's capital city of Vientiane.%0A%0AKing Rama III awarded her the title Thao Suranari, (or Lady Suranari – "the brave lady") in recognition of her courageous acts.%0A%0A statue of Thao Suranari stands in the centre of Nakhon Ratchasima, and is a popular object of devotion. 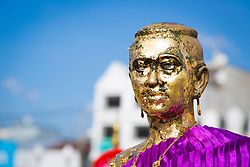 The statue was designed by Phra Thewaphinimmit (1888–1942) and sculpted by Silpa Bhirasri.%0A%0AThao Suranari's statue was placed next to the Chumphon Gate of the city wall on January 15, 1934.